That’s the entirety of my 3-star Flixster/Rotten Tomatoes review, which I wrote years ago and recently rediscovered while preparing for this review. I remember the mindset that was informing this review. I had watched a few sneak peak clips back when IGN.com used to be my primary source for movie news, and those brief, minutes-long clips had set my expectations for the entirety of the film as being something more akin to Reno 911 in an English countryside than what the film actually turned out to be: a loving tribute to ridiculous buddy cop/crime films – as filtered through the English countryside. I still don’t adore Hot Fuzz nearly as much as I do its predecessor, Shaun of the Dead, but the charms of the film have certainly grown on me, and this second entry in what is now officially known as The Three Flavours Cornetto Trilogy (to be concluded by this year’s The World’s End) is far more gag-filled, fast paced, and enjoyable than circa-2007-me realized at the time. 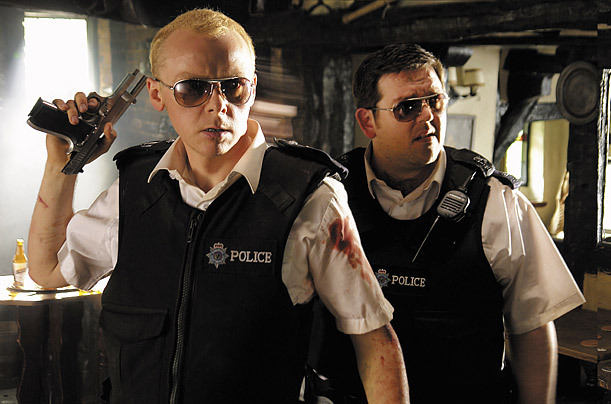 Simon Pegg plays Nicholas Angel, a respected but incessantly serious London policeman – er… officer – who has seen his fair share of action, culminating in a stab wound to the hand by an angry Santa Claus. Angel’s dedication to his work has not gone unnoticed, and, at the start of the film, he’s promoted to sergeant. The only problem is, there’s no more room left in London (and he’s making everyone look bad, too), and so, much to his chagrin, Angel is forcibly transferred to the teeny, laidback town of Sanford, where the primary concern seems to be winning the “Village of the Year” award and keeping the pesky Living Statue at bay. Angel’s new partner is Danny Butterman, the excitable, frequently drunk son of Inspector Frank Butterman. Danny is immediately fascinated by the prospect of working alongside a city cop, a man of action, not unlike those found in the Michael Bay movies he loves. But Sgt. Angel is nowhere near as fun as what Danny had imagined, and Angel’s continued dedication to his job once again make him the object of scorn for his fellow police officers – and though you’d think that at least the townfolk would be grateful for his efforts, it immediately becomes obvious that something far more sinister is going on here in the little isolated town of Sanford than anything Angel encountered back in the big city. If Shaun of the Dead was a story about a slacker learning to grow up and live his life to its fullest potential amid a zombie apocalypse, Hot Fuzz is like a caution to take it all in moderation – an action movie (complete with 007 composer David Arnold) that ironically encourages the serious-minded to relax once in a while and the children-at-heart to let their seemingly silly fascinations and interests make them better workers. Once Angel starts becoming friends with Danny as they share a few beers and bond over Point Break and Bad Boys II, all the pieces of the recent crimes begin to fall into place, and the duo ultimately balances out to get the job done. Of course, all this interpreting might be a serious over-sentimentalizing of the movie, but when it’s recently been reported that The World’s End will close up thematic trends across Shaun and Hot Fuzz, it’s hard not to make such interpretations. Luckily, even if you’re not into the analytical aspect, this is still consistently an incredibly funny film, continuing the clever wordplay and callbacks in different contexts that made its predecessor such a delight. I sincerely don’t know what I was thinking when I wrote that review up there, as this is even more purely satirical in tone than even Shaun of the Dead, which had a few moments of sincere emotional honesty. That’s not a knock on this film at all, however. 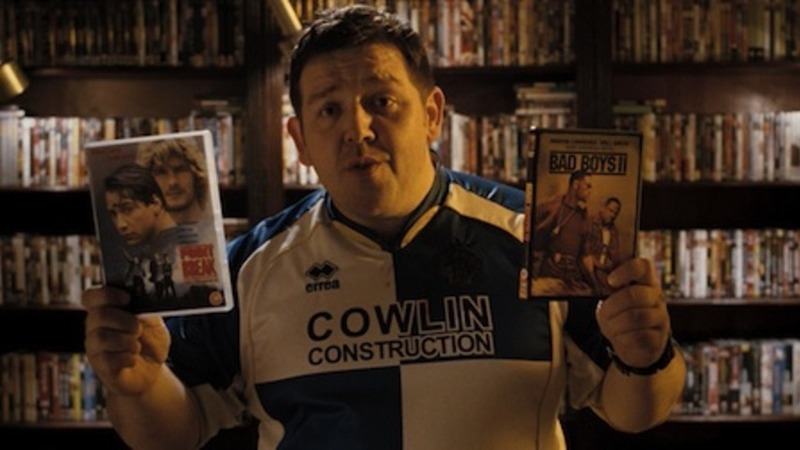 Nick Frost’s Danny isn’t too far off from his role as Ed, being just a bit less crass and a lot more childlike but still essentially the same, but that’s not to the film’s detriment, especially considering that this is sort of a quasi-sequel in a tenuously connected trilogy of films. He’s perfectly suited and likable in the role, and is a welcome contrast to Simon Pegg, who plays Nicholas Angel with a steely, humorless persona for much of the film before his transition to a steely, badass action hero. The supporting cast, also made up of several returning bit players and featuring more celebrity cameos (including an uncredited, masked Cate Blanchett and even director Peter Jackson as the murderous Santa who stabs Angel), are a blast, and Timothy Dalton’s gleefully evil as the film’s primary villain, a local grocery store manager. 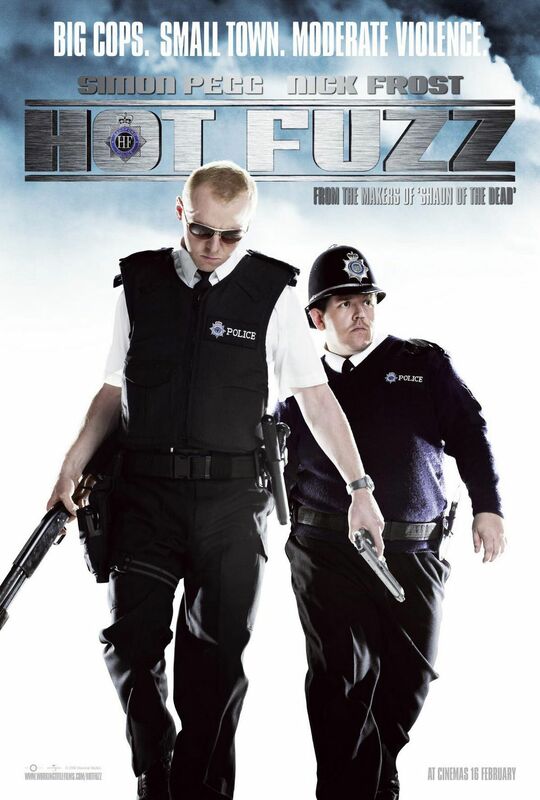 Having had the time to readjust my expectations since its release all those years ago, I think I owe Hot Fuzz an apology. It set out to entertain as an action film homage, and I misunderstood it based on false, unfair expectations. The movie I wanted, where multiple crimes were solved within a span of an hour and a half or so, probably would have been fun, sure, but would it have been as timeless? Edgar Wright, Simon Pegg, and Nick Frost probably could have made it great, but I’m not so certain that it would have been nearly as thematically consistent with the rest of this trilogy, and while it may have been faster-paced, it would have likely lost its subtle nuances, too – I love that all but one word, the most offensive word on the list, is less-than-cleverly censored on the police HQ swear box. Needless to say, I was misguided before, and I recognize that now. And, as penance and a show of critical honesty, I’m granting the film one more star.